Decibel Insight has opened new offices in Boston, MA, and Austin, TX, and made two significant new hires off the back of a 2,200 per cent increase in revenue year on year. 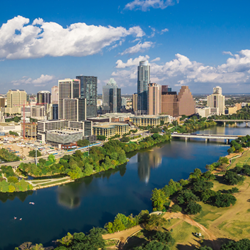 One of Decibel Insight's new offices is in Austin, Texas. Opening new offices in Austin and Boston goes some way to realizing our growth ambitions but in no way satisfies them. Decibel Insight, the fastest growing enterprise customer experience analytics platform globally, has opened new offices in Boston, MA, and Austin, TX. This expansion comes at the same time as two significant new hires into the global team. Nick Herbert, former Director of Sales at Velaro, joins as Enterprise Sales Executive in Boston, MA; while Aaron Wine, former Strategic Account Manager for Epicom Corporation, joins as Enterprise Sales Executive in Austin, TX. Between them, these new additions to the team have decades of experience in the enterprise technology sector. Nick Herbert said, “I’ve spent my career with SaaS companies, and Decibel Insight is by far the most compelling technology I’ve come across in this space. This expansion into new US markets consolidates Decibel Insight’s rapid growth over the past twelve months. Staff headcount has tripled, whilst their proprietary customer experience analytics platform has been adopted by a number of major US brands. This growth is also reflected in business results, with a 2,200% increase in revenue year on year. Decibel Insight’s CEO, Ben Harris, said: “Aaron and Nick are brilliant additions to our growing global team. Their expertise in the SaaS space makes them a natural fit for our business. Decibel Insight empowers enterprise-level digital marketers and web analysts to put customers at the heart of their websites. Its award-winning technology tracks and records what website visitors see and what they do, enabling marketers and web analysts to forensically examine their behavior and use that insight to improve the on-site customer experience. Backed by the UK Government, Decibel Insight launched at the end of Q1 2014 after three years of development and beta testing, and is now the most advanced product of its kind globally, surpassing its competitors and being used in over 50 countries.